You can see a timelapse video below, covering 93 minutes of imaging, again on October 21. It’s obvious ISON is still intact and it continues to bright, as it is currently about magnitude 9. Update: This new one is just in from astrophotographer Damian Peach, and its a beauty! Taken on October 24. 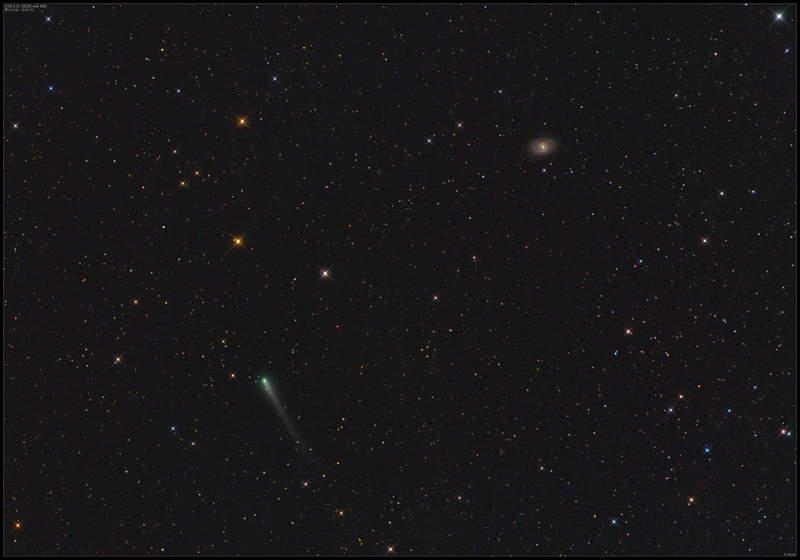 Comet C/2012 S1 ISON captured passing fairly close to the bright barred spiral galaxy M95 in Leo on October 24, 2013. Credit and copyright: Damian Peach. 6 minutes 6 secs. Credit and Copyright: John Chumack. Warrenton, Virginia at 6:27am EST looking over Washington D.C. Triple conjunction of Comet ISON, Mars, Regulus on October 14, 2013, as seen from Payson, Arizona, USA. Credit and copyright: Chris Schur. Chris used a Canon Xti, ASA800 with 10 minutes total integration time, with a 80mm f/4.8 Ziess APO refractor on a Televue GEM. Taken from Payson, Arizona at 5,100 feet elevation. Wasn’t ISON the comet of the century? Or is it going to be the next “¿Where is PANSTARRs”? I’m in Idaho, and I knew nothing of comet Ison until last night, I was star-gazing, and happened to glimpse a blue streak, right above my head. It was extremely small, and quick. I’ve only ever seen “shooting stars” and I knew this was different. Was it a comet? And if it was, was it comet Ison? I plan on going out tonight, and seeing if the position that it is in ( between constellation Virgo and Leo ) was where I saw this. I am so excited! Just curious of what I saw.